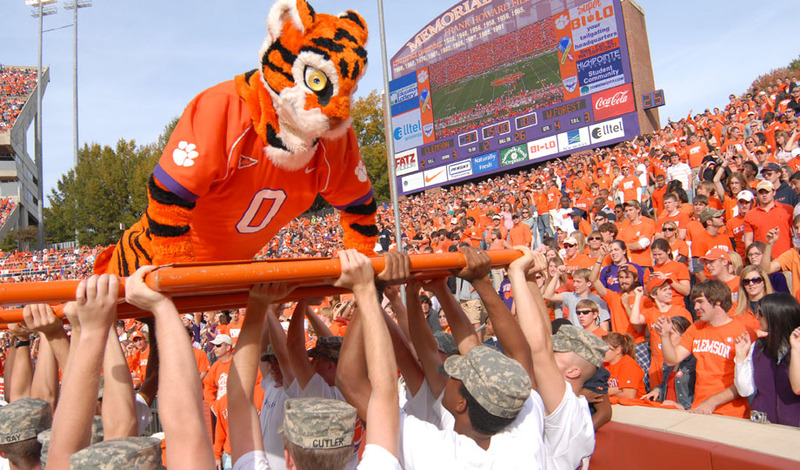 The Clemson tiger does push-ups after a touchdown at a football game. Photo courtesy Clemson University. “There’s something in these hills,” something that connects us, the students, faculty, and staff of Clemson University. At least, that is what Joe Sherman (Clemson University class of 1934) claimed in his 1969 poem, “Something in These Hills”. I have heard excerpts from the poem many times, but now, in the wake of the Sikes Sit-In, I am really wondering, what is in these hills? Although Joe Sherman gives examples of what he believed were in them, my four years of undergraduate studies at Clemson have included almost none of the things Sherman names, besides the beautiful scenery. When one talks about Clemson’s “traditions” (one of my least favorite words since the “Cripmas” party of December 2014, during which White students dressed as stereotypical portrayals of African American gang members), it is hard not to question whether the speaker knows the full history behind the tradition(s) they embrace. At Clemson, folks who rally behind the “Solid Orange” lifestyle speak of traditions like purchasing the Clemson ring, wearing orange on Fridays, and having the football players run down the hill as they enter Memorial Stadium (more affectionately known as Death Valley) during their pregame ritual. However, many within the “Clemson Family” do not know, or else subconsciously ignore, Clemson’s more problematic traditions. Someone at the Sikes Sit-In told me that “Solid Orange is the old White,” playing on the title of the Netflix series Orange is the New Black. In many ways, that’s correct. Being “Solid Orange” means fitting into a mold of Clemson’s (Eurocentric) exceptionalism, to which we all must aspire, forsaking everything that makes us unique so that we graduate prepared to proclaim loudly and proudly that we are Clemson Tigers, tried and true. However, the Clemson way has not always been inclusive (or even tolerant) in any sense of the word, especially in its treatment of people of color. Tigers have black stripes. But Clemson Tigers, with their celebration of “Solid Orange,” often fail to see blackness. With the glaring fact that there were no visible signs of the true history of the campus and the former plantation land of John C. Calhoun, the “See the Stripes” campaign arose. It is a direct response to all that “Solid Orange” stands for. As a good friend of mine, A.D. Carson, puts it in a poem carrying the name of the campaign, “The site of ‘the most exciting 25 seconds in college football’ / was made possible by profits from the most shameful centuries in America’s history, / but come to the campus of Clemson University, / and you’d hardly be able to tell it from looking around.” Until recently, historical markers told nothing of the “dark era” of Clemson’s past. Visitors are drawn into the beautiful landscape. They are taken by Old Main (currently still known as Tillman Hall by many who are “Solid Orange”), are told of the Education Department that is currently housed there and, depending on which tour guide they have, they may be told about the fire that destroyed the original building shortly after it was built. However, they are not told much (if anything) about the man for whom the building is named — Benjamin “Pitchfork” Tillman. They are not told about his involvement in the Hamburg Massacre, during which seven African-American members of a local militia lost their lives at the hands of White democrats led by Tillman. Nor are they told about Tillman’s other virulent attacks on Black people. After the Clemson Faculty Senate encouraged the Board of Trustees to change the building’s name, the former Chairman of the Board, David Wilkins, said in a statement that “other, more meaningful, initiatives should be implemented that will have more of an impact on the diversity of our campus than this symbolic gesture. Every great institution is built by imperfect craftsmen.” This is true, but not all of these craftsmen built their legacies on the hatred, disenfranchisement, and boastful murder of Black people. There is truly something horrific in these hills if Wilkins believed that this response was not at all tone deaf. By referring to Benjamin Tillman simply as an “imperfect craftsman,” he is encouraging silence about who this man really was — a racist, White supremacist, murderer — and downplaying legitimate concerns about the university honoring such a detestable figure. In fact, without English Professor Dr. Rhondda Thomas’s research on the roles of Blacks in Clemson’s history, and the publicity it has received, I doubt there would have been the recent push for the new historical markers that will soon be visible across campus. However, if the university wants to preserve its reputation in the light of its refusal to disclaim our founders and their ideals, it really has no choice. and you’d hardly be able to tell it from looking around. By providing us with language that challenges the “Solid Orange” narrative, Carson changes how we think of being “one” Clemson. He makes us second guess our willing assimilation to the dominant Clemson culture. What he is insinuating, in addition to many other things, is that the language surrounding culture at Clemson can be seen as a kind of whitewashing in orange, which attempts to cover the history of cheap and free Black labor that made the school what it is today. But even as Sherman acknowledges a portion of the role that convict labor played in Clemson’s construction, he neither thanks nor shows his appreciation for the laborers themselves. Thanks to Dr. Thomas’s research, we have learned that these individuals, mostly Black, were usually convicted of petty crimes and then rented out as cheap labor, with which Clemson and other institutions built their foundations. The laborers themselves had no hope of ever studying at these schools. Neither did their children. The same can be said of generations of Black staff members who would come later, working relentlessly to keep Clemson University running smoothly. These workers, regardless of the fact that they were (finally) being paid for their labor, were also barred from entering the college as students until January 1963, when Harvey Gantt became the first African American to be enrolled as a student at Clemson. From the establishment of the 600-acre Fort Hill Tract (the name originally given to the land granted to Robert Tate by the state in 1784) to the preservation of the John C. Calhoun plantation house that remains at the center of the university, those who have controlled this land have again and again silenced and ignored the Black voices and bodies that inhabit the land, work on it, and call it home. By simply referencing the institution of convict labor on carefully worded historical markers, without acknowledging these laborers as people or the lasting impact that Clemson had on the exploited African-Americans and their descendants, the university is committing violence to their names, violence to the truth behind why they were sent to Clemson in the first place, and violence to the legacy of Black people who resisted the conditions in which they were being forced to live. If one wants to talk about Clemson traditions, this should be acknowledged as a crucial and honorable one — the tradition of resistance and refusal to give up. Although the convict laborers and other Black workers were given the worst of the lot, they did what they could with what they had. This is not a tradition that Clemson would wish to highlight, but it is a core part of our history. We must see and acknowledge the stripes that we bear in order to learn about, and honor, the people who made Clemson possible. During a recent visit to Fort Hill, John C. Calhoun’s historical plantation home at the heart of today’s campus, one of my classmates asked our tour guide about any documented acts of resistance by the slaves who lived on the plantation. The guide and her intern answered by explaining that a lot of records were lost during the fire of 1894, including some of John C. Calhoun’s personal papers. However, I have toured the plantation before, and I learned from another professor about slave resistance on the plantation. A fuller and more honest answer to my classmate’s question would acknowledge stories like this one: “Sawney was the son of Old Sawney, a childhood companion of John C. Calhoun. Because of his father’s relationship with Calhoun, Sawney was allowed the privilege of doctor’s care. On one trip to the doctor, he set fire to the White overseer’s tent, apparently attempting to kill him. Sawney was subsequently sent to live in Alabama on the planation known as Canebrake, which was owned by Andrew, Calhoun’s eldest son.” Another story reads, “Another child of Old Sawney, Issey was a strong-willed and defiant house slave who attempted to burn the house down by placing hot coals under a pillow in the room of another of Calhoun’s sons, William. Luckily, the smell of burning feathers floated throughout the house, and the fire was extinguished. Although described as dangerous, Issey remained at Fort Hill until freed.” These stories of resistance and perseverance in the face of injustice should be part of Clemson’s traditions, not covered over. The university has not done a good job of encouraging “the Clemson Family” to question its history and to think critically about the words and actions that shaped the past and are shaping the present today. Therefore, it is easy to see why, to this day, Joe Sherman’s poem has remained a crucial part of the narrative told about the university. Along with other contributors to this narrative (including Dr. Jerome V. Reel’s history of Clemson called The High Seminary Vol. 1 and 2), the poem helps drown out the voices who speak against the dominant image of the university. However, those voices still speak out. I represent one of those voices. Every time I hear any part of Sherman’s poem, I laugh to myself because it does not reflect the Clemson that I know. But when Sherman writes, in the voice of a graduating senior, “Excepting only my parents, Clemson has meant more to me and done more for me than anything that has touched my life,” I can actually agree. Yes, Clemson has meant a lot to me, but not in all the ways the poet implies. Like I was told long ago, blood is thicker than water. But sometimes, that blood runs thin. I think of this as I walk around campus, longing for the Clemson family that should exist here — an honest, open, compassionate family. Thankfully, a few of my friends and other concerned students, members of the lower administration, faculty, and staff have also been searching for a truer sense of community. Together, we created a real Clemson family, embodied in the Political and Multicultural Center for Clemson University housed at Sikes Hall, the home of the advertised “Clemson Family.” It is sad that it took up until the last three weeks of my undergraduate career, nine days of occupying the administration building, and some of my closest friends being arrested for “trespassing” to finally bring this family to fruition. Nonetheless, I am thankful. I just wonder how long it will take for the rest of the “Clemson Family” to come and join us. When Sherman tells us that something is in these hills, he is not telling half-truths. It is clear what is in these hills if one looks hard enough. It is the suppression of the voices that have been trying to speak out for centuries. Now, we are working to let those voices finally be heard. And they will be. They will scream from the tops of the hills that Sherman writes so passionately about, and no longer will they be muffled. The next time someone tells you that there is something in these hills, tell them to listen.